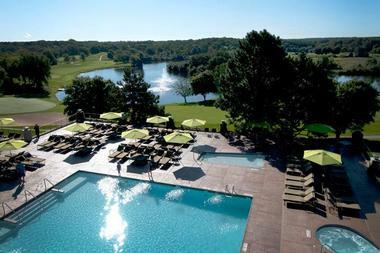 The AAA Four Diamond-rated Grand Geneva Resort and Spa is located in the midst of scenic countryside on the outskirts of Lake Geneva in South Wisconsin, about an hour and a half from Chicago and an hour from Milwaukee. This charming resort is set on its own private lake and has numerous amenities including restaurants, golf courses, snow-sports facilities, swimming pools, tennis courts, and a spa. 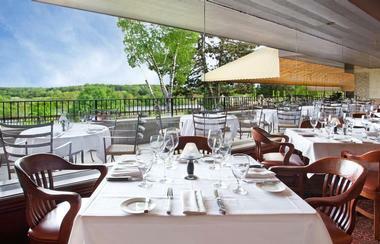 Grand Geneva Resort and Spa has 355 rooms and suites, all furnished and decorated in a lakeside country estate style. Rooms and suites are equipped with one king or two double beds made with white cotton bed linen that elegantly complements the natural beige and brown furnishings of the living accommodation. Every room and suite has a mini-refrigerator and LCD flat-screen television, and a desk fitted with various audio visual ports to accommodate devices such as laptops and digital cameras. All bathrooms are equipped with products from the hotel’s own spa range and have granite or marble vanity tops. Bathrooms also feature a television embedded within the mirror. Each suite has its own private furnished patio or balcony with views of the lake and golf courses. Deluxe Guest Rooms are available in King or Double layouts, each with a private furnished patio or balcony that provide views of the lake and golf courses or courtside. 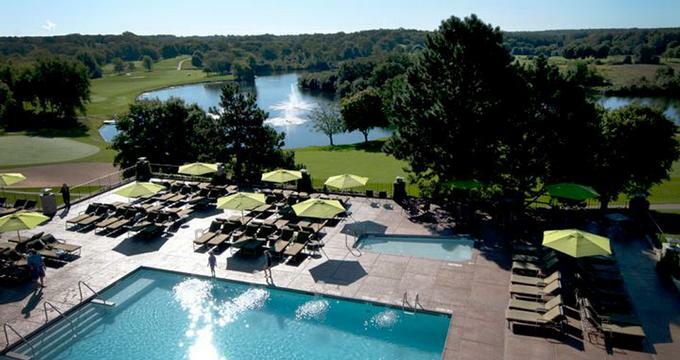 Ask for a room with lake and golf course views to enjoy the best of the resort’s scenery. There are five different suites available, all with spacious accommodation, wireless high-speed Internet, and Geneva Club membership. The Junior Suite is equipped with a king-sized bed and a gas fireplace. This suite is particularly suited to romantic getaways. The King Suite has a king-sized bed and a wet bar, and some feature a queen-sized sleeper-sofa. The Premier Suite has the option of one king or two double beds in a separate bedroom area with additional sleeping space thanks to a queen-sized sofa bed. The suite includes a second LCD flat-screen television, a wet bar with granite tops, and an island with bar stools. The Premier Suite also has a larger bathroom featuring marble vanity tops, shower with four showerheads, and jetted bathtub. The Executive Suite boasts a separate bedroom with a king-sized bed and its own LCD flat-screen television. The accommodation features a gas fireplace, LCD flat-screen television, wet bar, and dining table. Like the Premier Suite, the Executive Suite has a large bathroom with marble vanity tops, a shower with four showerheads, and generously sized jetted bathtub. The Grand Suite is the most spacious of the resort’s suites with 1,400 square feet. The suite’s separate bedroom has its own gas fireplace, while a second fireplace is located in the generous living area. There is a kitchen equipped with a full-size refrigerator and microwave and a large dining table. Bathing facilities include a whirlpool bath, an additional half-sized bath, and a shower. 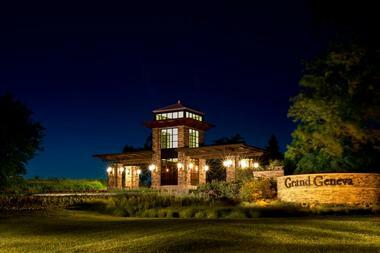 Grand Geneva Resort and Spa has on-site facilities called the WELL Spa and Salon. This facility includes the Fitness Center, which offers activities such as yoga and cycling. There are indoor and outdoor tennis courts, an indoor lap pool, sauna and steam rooms, an indoor rock-climbing wall, and a basketball/volleyball court. Spa and salon treatments include massage, facials, acupuncture, manicures, pedicures, and hair services. Junior spa services include facials, make-up tuition, and a personal trainer session designed for teenagers. Lunch is available if requested. 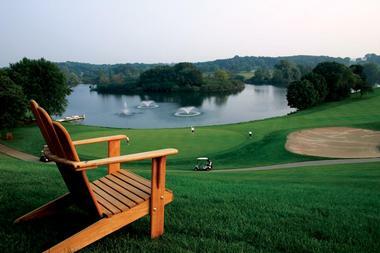 Grand Geneva Resort and Spa boasts two championship golf courses: the Brute and the Highlands. The Brute is considered one of the state’s best courses, extending for over 8,000 square feet with 68 bunkers. The Highlands is a Scottish-style course that underwent renovations in 2006. There is a learning center with tuition for those new to the sport, a practice area, a GPS yardage system, and a fully stocked Golf Shop. Players can recharge with the refreshment cart service or at the Links Bar and Grill. With a mouth-watering selection of Martinis, mixed drinks and port, the Lobby Lounge is perfect for savory starters and pre or post-dinner cocktails. Daily live evening music includes contemporary jazz, solo pianists, and guitarists. Outside Geneva ChopHouse is the delightful Embers Terrace. The terrace surrounding the huge outdoor fire pit where desserts and cocktails are served every evening with live entertainment on Friday and Saturday nights throughout summer. Evolve is both an eatery and a nightclub, opening at five o’clock on weekdays and at noon on weekends. A variety of tempting starters and desserts complemented by a comprehensive range of spirits, beer, and cocktails are available. A live DJ provides the entertainment on Friday and Saturday nights. Eateries at the Neighboring Timber Ridge Lodge Smokey’s Bar-B-Que House is open daily for breakfast, lunch, and dinner, serving fresh chicken wings, brisket beef, seafood dishes, and weekly specials. Hungry Moose Food Court is situated next to the water park and has a pleasant poolside setting. The Food Court is open daily for breakfast, lunch, dinner, and snacks. Bars serving beers, wines, spirits, and cocktails can be found in the Geneva Club, the Lobby Lounge, Embers Terrace, and at the Cool Water Cucumber Pool Bar. Alcoholic beverages are also available on the Mountain Top at Leinenkugel's Mountain Top Lodge and in the Evolve nightclub. Guests can relax in lounges situated in the Geneva Club, Lobby Lounge, or outside on Embers Terrace and on the patio at Links Bar and Grill. Grand Geneva Resort and Spa has twelve on-site venues where visitors can enjoy fine dining, casual dining, beverages, and entertainment. This includes two eateries on The Mountain Top for those participating in snow-sports. Two additional venues are located at the nearby Timber Ridge Lodge, with a free trolley service running between the hotels. 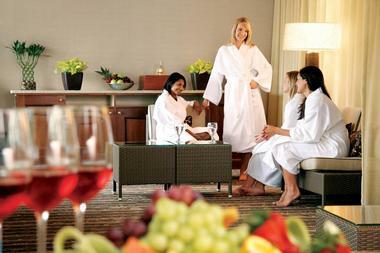 Guests visiting the spa or fitness center can have their lunch at the WELL Spa and Salon. Grand Geneva Resort and Spa offers room service with a wide selection of menus consisting of breakfast, hospitality, all-day dining, Ristoranté Brissago (Italian cuisine), and Geneva ChopHouse (steaks and seafood). The Spa and Salon Lunch is also available with an additional delivery and service charge. Room service orders are taken by telephone with food served daily between six-thirty am and midnight. The Geneva ChopHouse serves fine steaks and seafood and is open daily for dinner and for Champagne Brunch on Sundays. The chefs source new local ingredients each month and creatively use them in the featured dishes. Italian food is available at the Ristoranté Brissago complemented by an extensive selection of wine. This fine dining experience includes monthly featured dishes created with new ingredients sourced by the chefs. Ristoranté Brissago is open for evening meals between Tuesday and Sunday. The excusive Geneva Club is open to hotel guests only and can be found on the main level opposite the Geneva ChopHouse. Comprising a library-style lounge and a casual dining area, Geneva Club is open daily serving breakfast, lunch, and dinner, as well as hot drinks, snacks, and alcoholic drinks in the evening. Links Bar and Grill is open for breakfast, lunch, and dinner and is ideal for casual meals. They offer sandwiches, burgers, salads, and drinks include delicious cocktails. Links Bar and Grill is adjacent to the golf courses and features a patio, making it perfect for refreshments after a round or a stroll about the grounds. The Cool Water Cucumber Pool Bar serves a variety of refreshing food and drinks including salads, sandwiches, burgers, and refreshing frozen beverages. Situated next to the outdoor pool, the bar is open daily with food served between eleven and six. Lunch is available daily at the WELL Spa and Salon, which offers starters, soups, salads, and sandwiches. Leinenkugel's Mountain Top Lodge is perfect for those enjoying snow-sports on the Mountain Top during winter. Open daily, Leinenkugel's provides appetizers, salads, soups, pizzas, burgers, and wraps. Warm up with a coffee, hot chocolate or a deliciously spiced hot cider drink. Tap, domestic, and imported beer are also available. The Grand Café provides a casual dining environment and offers seasonal contemporary American cuisine. A breakfast buffet, lunch, and dinner are available daily while a Prime Rib and Seafood Buffet is available on Friday and Saturday evenings. Café Gelato serves Starbucks coffee, fruit smoothies, and soft drinks like Pepsi as well as Gatorade. A wide range of candy and gelato is on offer, the latter of which is a creamier yet healthier version of ice cream. Conveniently situated in the lobby, Café Gelato is ideal for a morning pick-me-up or a delicious afternoon ice cream treat. Timbers Grill is a cafeteria-style venue on the Mountain Top aimed at those wanting to get back on the slopes as quickly as possible. The Grill serves a wide range of food including nachos, tacos, burgers, wraps, hot snacks, and salads. Drinks include coffee, hot chocolate, and Red Bull. Families are very welcome at Grand Geneva Resort and Spa, and kids will enjoy many of the on-site facilities such as the swimming pools, junior spa services, and snow-sports. The Experience Team organizes daily activities for the children. Nearby is the Timber Ridge Lodge, which is home to the Moose Mountain Falls Water Park. The indoor and outdoor areas feature slides, a heated pool, a hot tub, and numerous activities for all ages. For outdoor diversion, horse riding for any age is also available. Grand Geneva Resort and Spa is an idyllic venue for weddings, and its breathtaking surroundings are complemented by exquisite cuisine and attentive service. There are a wide range of locations to choose from, including ballrooms for large parties and smaller rooms for more intimate ceremonies. The on-site Lake Geneva wedding specialist is on hand to arrange everything from catering to floral arrangements, as is the American Audio-Visual Center to help those who have any custom lighting requirements. Discounted rates apply to accommodation for wedding parties, including a complimentary wedding-night stay for the bride and groom. 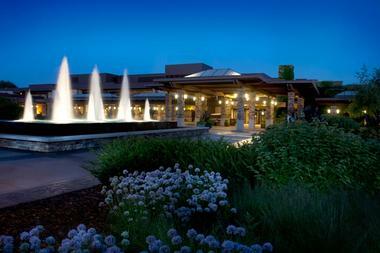 Grand Geneva Resort and Spa is a popular venue for reunions, meetings, and conferences. With 62,000 square feet of meeting space, the resort can accommodate groups of ten to fifteen hundred. The accommodation includes boardrooms, a convention center, ballrooms, break-out rooms, and outdoor event spaces. The cozy ski chalet is also available for winter parties. The venue technology includes wireless Internet and video conferencing facilities. Reunions, meetings or conferences can be enhanced with superb catering, team-building exercises, group fitness classes or a round of golf. Delegates can be accommodated overnight or for longer periods of time in the rooms and suites of the resort. The Geneva Club, situated on the main level of the resort, is an exclusive area exclusively for guests. 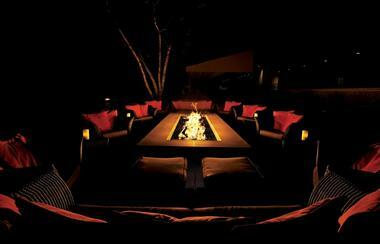 The club consists of a comfortable lounge and casual dining area warmed by a cozy fireplace. Equipped with televisions, Wi-Fi Internet, workstations, printers, and bookshelves, guests can dine, relax or catch up on work. Members receive special pricing on certain alcoholic beverages, and a Club Concierge is always on hand to provide assistance. While membership is included with all suites, Geneva Club membership can be added to any Deluxe Guest Room for an additional charge. Grand Geneva Resort and Spa is pet friendly and allows up to two dogs per room. Pet friendly rooms are limited to those with courtside views and are subject to availability. There is a weight restriction of twenty-five pounds per dog, and additional fees apply – with the exception of medical service animals. Guests are provided with a handy clean-up packet and “Guest of Grand Geneva” identity tag for each pet, and there are designated dog-walking areas. Assistance dogs are permitted in all areas of the resort. The resort has a variety of available packages that provide discounted accommodation or participation in sports, and there are special rates for military and government personnel. Packages vary throughout the year and accommodate sports vacations, families, romantic trips, and special events such as the Lake Geneva Festival of Wine. You may also like: Best Romantic Weekend Getaways from Chicago.